Ninja & Pirate has been updating weekly for some time now. We heve previously updated on Tuesday. In an effort to give you a better looking and more well rounded comic I’m pushing the comic update to Wednesday. On another note the comic now has a forum. Just click on the forum page and the word forum in the center to check it out. See you there. On www.patchtogether.com/designs/steam-kitty-3800.html My Steam Kitty design has gone up for voting. If I win, my art gets made into a limited edition statue/toy! 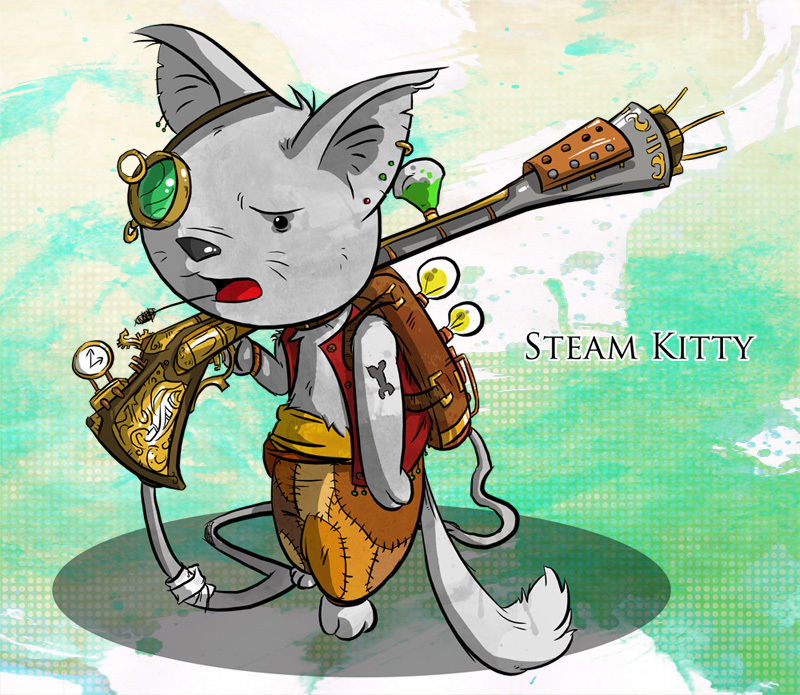 All you need to do is sign up and vote for my steam kitty design. I know signing up is a hassle but every vote is important. Please show your support. If the voting goes well who knows, their might be Ninja & Pirate toys on the horizon. Interested in wearing some of the art seen on this site? We are announcing today that we have put a few products up for sale on cafe press. (Accessible at the above link.) The cafe press store went up just prior to Connecticon 2010 for those of you who have checked out our links section already. We have many other products planned so check again for more news and updates later this month. For wearable art requests that you do not yet see on cafe press that you love on this site, email Gabe@finkensteinstudios.com . We’d love to hear from you. Big news, my website is up. I know that doesn’t sound particularly mind blowing but I’m super jazzed. As some of you may know a few months back I launched this site for my web comic Ninja & Pirate. I was excited at my first attempt at the world of web comics. After working on this comic for several weeks what I began to look forward to even more was having a site to show my art. Not just my comic but my portfolio and ideas. Now FinkensteinStudios.com is up and I have stuff planed to make it the place to be for geek shirt designs, games, comics, reviews and so much more. So If you haven’t checked it out yet give it a go and let me know what you think. I love to hear from people so message me. Let me know if there’s something you would like to see. So first off, I’m still working out a posting schedule for myself. I think comics will be posted weekly and go up some time Tuesday afternoon. I have this weeks comic set to post for later today just being picky with some of it. 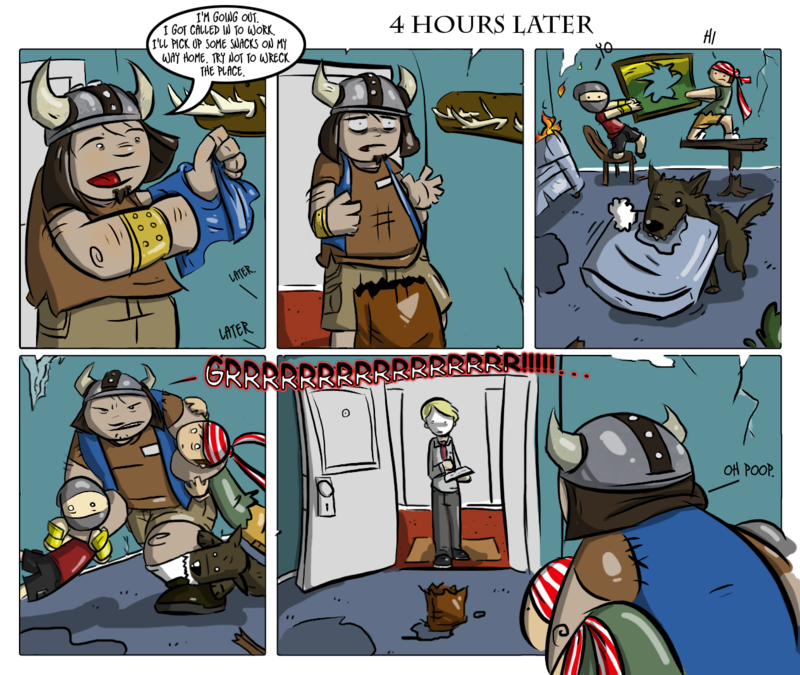 If you’ve come here form my deviant art page (darulz.deviantart.com) you may have seen the first two comics that are in my archive but starting today all of the Ninja and Pirate web comic will only be posted here. So stay tuned. I have some big plans for this site in the upcoming weeks.